I thought maybe I would microblog, a little bit every day, even though I don't exactly want to. I won't hold myself to it, I don't make resolutions, I don't believe in all of that. My brain is very sick. When my brain gets sick like this, I can mostly do a good job of pretending to people that it isn't. I can look like I'm home and sound like I'm home, but inside, my brain is in such distress that I can't find myself anywhere. It's like that scene in Home Alone (forgive me) when Kevin fools the robbers into thinking a great party is going on. The lights are on, the music's blasting, there are people moving inside. From the outside everything is normal--lit up, even. But in reality, the inside is empty. There isn't anything good. Anywhere. So there's your John Hughes/Depression analogy of the day. Finally I said all of this to Noah, which was incredibly hard, so so hard, but I felt better afterwards. I felt better today. I'll be on Wellbutrin again soon. Last night I was doing Yoga With Adriene and she said something about "trauma to the emotional body". That was it, exactly. My entire body felt bruised and sore, like I had been beaten. My brain had been beating me for weeks. 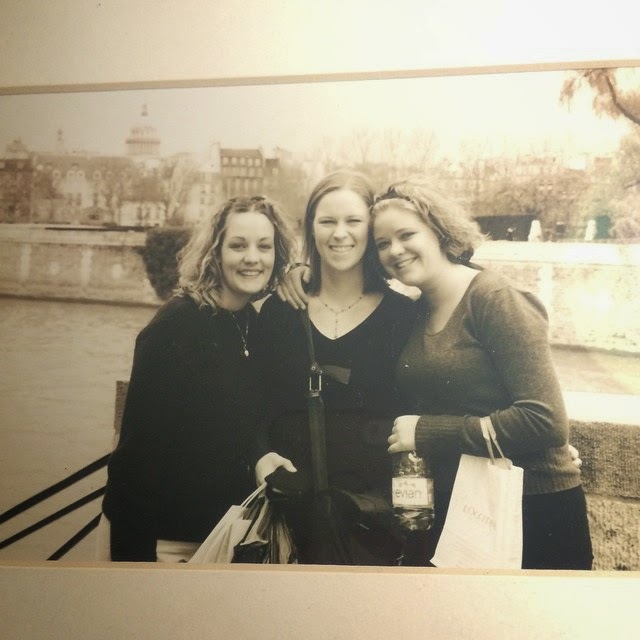 In March of 2002 I went to Paris with three girlfriends. Travel has always been one of the most important things to me--I used to think it was more important, even, than writing. That was when I was writing but couldn't travel. Now I'm going to travel, but I can't write. Of course, now writing feels utmost, travel second. Of course. In March 2012, despondent that I hadn't been back to Europe in ten years, I made a solemn vow to myself that I would go again by 2022. (I know it is ridiculous to be despondent over not going to Europe) I called my best friend and made her witness to my vow. I assumed I'd be getting my passport stamped somewhere close to midnight on December 31st, 2022. Then, a few weeks back, my husband found himself in a position to buy me a ticket to Paris. Knowing how much Paris means to me, he did. He bought it for me and I'll be staying there for two weeks, by myself. Traveling alone is something I've always wanted to do and I can't believe it's going to happen. You probably can't tell from the tone of this blog but I am thrilled, I'm so excited, I could cry. I have bought lots of clothes in black and white and I am READY. Okay. That day, the day I made the solemn vow, I still believed in signs, I was hungry for signs. I vowed that one day I would go back to Paris and then I put my tiny daughters in the minivan and got on the highway. A clear blue day, it was March, so I would have been coming out of my depression, or about to. I was wondering if I would really make it, would I ever really go back. A car passed me on the right. Its license plate said, "Oui." I am thrilled for you about Paris. You are living one of my dreams, inspiring me to make a vow too. As for the emptiness, I know my love. I know. Hold on tight. Breathe. Write anything you want. I'll read it. I'll be right here. Oh, god. This is fantastic. I am so sorry to hear of your depression and glad that you have medication that helps. But, Paris! By yourself! It absolutely sounds divine. I think good things might happen for many of us in 2015. Oh, you've made my day. Laying in bed last night before falling asleep, I was pining for Paris. Have never been to Europe, but after reading your blog this morn, its a sign for me for unfulfilled dreams...Microblogging sounds great to me. I usually get a few posts in a year... This might work for me too :~)). I've been using my SAD light since before christmas... I think it helps. Hang in there...love reading your blog! That was supposed to read "write a few posts s year". I'm a pretty lazy blogger. I'm very excited for you. Even if you aren't going to Euro Disney.